I struggled with definitions of mobile learning, as they all seem to wish to constrain the definition in a manner that best aligns with the authors desired research direction. 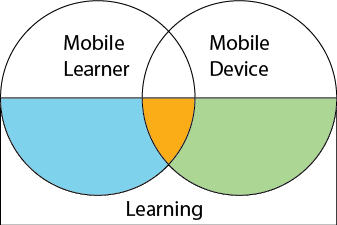 I don’t think this is wrong, I just didn’t like the inconsistency in the definitions and really wanted an inclusive definition of mobile learning. The first aspect of mobile learning, represented by the left circle, is the mobility of the learner. A mobile learner is a learner that is not in a classroom or in front of a desktop computer (home office, lab, etc). The learner need not physically be moving, but they are learning in a situation that is not considered a traditional learning environment. I call this type of mobile learning, learner-centric mobile learning. I was first introduced to this aspect of mobile learning in the book “Mobile Learning Communities: Creating New Educational Futures” (Danaher, Moriarty, and Danaher, 2009). The book focuses on “a group of people who are mobile for sustained periods of the year or of their lives and who recognize in themselves and others a common experience of mobility and a shared commitment to learning for themselves and other group members” (Danaher et al., 2009, p. 3). One of the examples they give is the children in a travelling circus and the programs develop to meet their educational requirements. Another example of a learner-centric definition of mobile learning is the study of the mobile context. Gil-Rodriquez and Rebaque-Rivas (2010) completed a research study where they watched learners who studied while commuting. There was no requirement for mobile devices, rather, the study focused on learners in a commuting context. The second aspect of mobile learning, represented on by the circle on the right, is learning that takes place using mobile devices. This includes learning that takes place in the classroom or other traditional learning locations. It is the use of the mobile device that makes it mobile learning. I call this type of learning “device-centric” mobile learning. There is a spectrum of mobile devices, ranging from portable computers such as laptop to mobile phones. Each researcher determines their own definition of what constitutes a mobile device. Inclusive definitions include any device, such as laptops, that can be used outside of a standard desk environment. A more common definition, such as the one provided by the eLearning Guide, specifies the size of the device: “any activity that allows individuals to be more productive when consuming, interacting with, or creating information, mediated through a compact digital portable device that the individual carries on a regular basis, has reliable connectivity, and fits in a pocket or purse” (E-Learning Guild, 2007). The introduction of the iPad caused a problem with the definition of mobile learning, as it does not fit within a pocket or purse, but is often considered a mobile learning device. To get around this quandary, Quinn suggests that mobile learning devices are “optimized to run applications for mobile use” (2011, p.31) which deems eReaders and tablets to be mobile devices but laptops and netbooks are not. Needless to say, the advent of new technology will constantly challenge us to define what constitutes a mobile device. 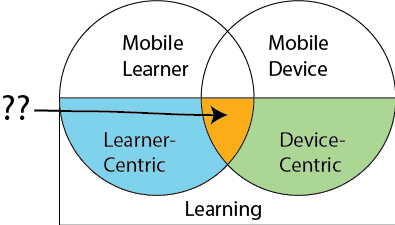 At the intersection of the learner-centric and device-centric definitions is mobile learning where BOTH the learner is mobile and a mobile device is used. I’m struggling with what to call this type of mobile learning. Originally, I thought that compound mobile learning might describe it well, but it really doesn’t have the flare that I’d like. Based on a comment I received on a different post, I thought purist mobile-learning, but that makes a judgment about the other forms of mobile learning, which I believe are just as valuable. So, I’ll open it up to you. What do you think the combination of learning-centric and device-centric should be called? Danaher, P., Moriarty, B., & Danaher, G. (2009). Mobile learning communities: Creating new educational futures. New York, NY, USA: Routledge. Gil-Rodriquez, E., & Rebaque-Rivas, P. (2010). Mobile learning and communting: Contextual interview and design of mobile scenarios. In Lecture notes in computer science (pp. 266-277). Quinn, C. N. (2011). Designing mLearning: Tapping into the mobile revolution for organizational performance. San Francisco, CA, USA: Pfeiffer. RE: A question for the group about language. As far as what we call things, I have an observation from North America (my only evidence is looking over paper presentations over the past five years at two national conferences on distance learning I regularly attend). It seems that academics and non-profits tend to use terms like "distance learning," and "mobile learning," Commercial entities are more likely to shorten these to "eLearning" and "mLearning." Is this true outside of North American conferences and meetings, in your experiences? I may have missed something, but mobile devices today allow a degree and speed of interaction with both the environment around you, as well as with other human beings that is unique, and fast becoming ubiquitous. Laptop computers, for example, are not usually equipped with global positioning, magnetometers and accelerometers that can detect both movement and orientation, multiple ways of establishing instant communication, etc, so perhaps the definition of mobile learning should include, mobile, interaction and multiple means of intant communication. Most smart phones and tablets today would qualify. The only issue I see with that type of restriction is the question of mLearning on the old feature phones. There are a lot of projects out there, especially in language learning and ICT4D that are mLearning with feature phones, mostly using the SMS features of the phone. They were the fore-fathers of mobile learning, so I wouldn’t want to create a definitely that didn’t fit with their views. Good point Rebecca. Thank you, and I did mean to include something about the old feature phones. I would consider SMS one of the interaction functions that I mentioned and obviously the older phones are limited in this way. However, it is hard to imagine manufacturers making devi ces in the future that do not include many, if not all of the features we have grown so accustomed to in smartphones. What mobile devices are becoming, and let's include tablets here, is really more of a personal communicator device and, at some point in the near future we may even stop calling them phones. Should we create a more generic definition now and modify it in the future or simply list the limitations of some older devices in a definition today? Is it possible that some of the existing language learning material will remain static or will they be updated to take advantage of the features of what today we call smartphones? I would like to think that we can find many ways to improve on existing learning material in this way. These distinctions are interesting, and clearly matter to those of us thinking about educational technology. However, I have a question: if the researchers in the Rodriquez & Rebaque-Rivas study are correct, then "mobile learning" has always been with us. Now making distinctions about platforms, from conversation, books and notebooks, laptops, mobile phones, and network (or cloud) computing devices is interesting for researchers, but is it something that students will find significant for themselves? So I agree that if one is going to name learning by device something else than, well, "learning," one should stay simple. Imagine what something would sound like if written up in a newspaper or reported on by NPR. And broader is bertter than narrow–most students or consumers will not be familiar with all the platforms that a professional is. You make a good point about technology distinctions. It reminded me that eLearning also suffers from the same lack of clarity, and we never really got over that. We try by using other words – you hear a lot more about “online learning” rather than eLearning. Then there is web-based learning, which may or may not be social and is also a completely overused and confusing term. So maybe, we just need to define it however we want and run with it. But then, not having a single defined terminology sure makes it a pain to do searches! The third category is on-demand learning. A traditional classroom is on-schedule learning. Learning outside a classroom without a mobile device is on-receipt-of-materials learning. Only by enabling the learner to access the learning experience/materials whereever and whenever they like (on-demand), do you get the compound effect. Vanessa I thought you meant to write mashup. (as the space isn't really M^2 but LD centric). I like John;s naming of the combined space but on-reciept dumps the tow other moblie pieces together. Rebecca how about calling the combined space experience-centirc as this learning has the student out in the world using the technology to gakn real-world knowledge. Thanks for ideas, so far we have: M-squared, on-demand, and experience-centric. I’m sure there are others out there? So far, I like the synergy with experience-centric because it aligns with learner-centric and device-centric and it doesn’t “close” the definition, it keeps it nice an open. Any other thoughts out there? I favor something easy to remember, evocative but not too layered in ed-tech speak since we want newcomers, non-cognoscenti and learners themselves not to be left too clueless. Maybe names should be tested on this group.